To draw an analogy with recent events, South Australia came close to having a major ‘pro bono’ outage in 2016. JusticeNet SA, South Australia’s principal pro bono clearing house and legal service faced the conjunction of extreme events and long term funding uncertainty. The storm has passed for now at least. Late last year JusticeNet SA was awarded a one-off $190,000 grant from the Law Foundation of South Australia for which it is truly grateful. The funding will ensure that JusticeNet can deliver important pro bono legal services and continue working towards a long-term plan to deliver financial sustainability. JusticeNet SA was launched in mid-2009 and immediately became a vital focal point for coordination of pro bono legal services in South Australia Inspired by the success of the Public Interest Law Clearing House (‘PILCH’) model (as they were known then), its future appeared secure as the beneficiary of the trail-blazing efforts of our Eastern seaboard counterparts. JusticeNet SA grew rapidly to have over 40 law firm and corporate members and commenced a productive and enduring partnership with the independent South Australian Bar Association. However, there have been some unique challenges. Easily the biggest challenge has been and remains the lack of reliable State government funding for the administration of pro bono in South Australia. Other independent pro bono clearing houses / legal services in other States receive some form of recurrent funding from ‘Public Purpose Funds’ or the like. Funding security has enabled them to develop an impressive range of innovative pro bono services and deliver positive outcomes for thousands of disadvantaged clients. It has been a big part of Australia’s world class pro bono effort. The second challenge has been the lack of national law firms with an Adelaide presence. Our firm members are almost entirely small to medium in size. This has meant less revenue for JusticeNet SA from membership fees and greater difficulty in being able to draw on the expertise of national firms. 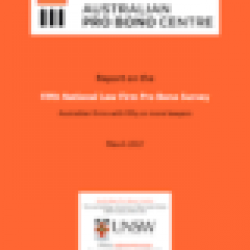 According to the Australian Pro Bono Centre’s Report on the Fifth National Pro Bono Survey 2016: Australian firms with fifty or more lawyers, a mere 1.9% of large law firm lawyers were based in South Australia, compared to 9.5% for WA and 15.0% for Queensland. our Self-Representation Service in the higher state courts will help around 350 people. South Australia was the first, and still the only, state outside of Queensland to have a Self-Representation Service. The State Government has just announced a power plan to secure South Australia’s energy future. In the lead-up to the March 2018 state election. JusticeNet is advocating for a ‘pro bono plan’ for securing the future of coordinated pro bono in South Australia.